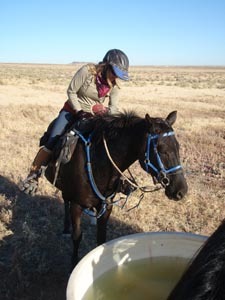 Note from Merri: I'm still trying to catch up from my last trip to the NAETC, from riding in our Owyhee Canyonlands ride, wandhile getting ready to go to Tevis (while watching the weather!). 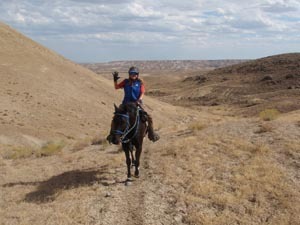 Meanwhile, guest blogger Connie has stopped by to give her impressions of our Owyhee Canyonlands ride together. We exchanged skills, passions, and interests over the years. I trained her to drive a horse carriage in Seattle, which she took over when I went on vacation. I also got her a job doing Northern Spotted owl monitoring. And I will be forever grateful to her for inviting me out to Owyhee 4 years ago. She said there was a 5-day endurance ride, and Steph probably would have some extra horses for me to ride. By this time, I hadn't hardly been riding since I walked away from the racetrack in 2001, burned out. I dreamed of horses. I would see them in pastures as I drove by and it was like seeing a long lost friend. 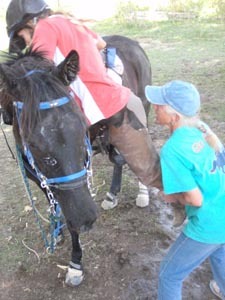 After doing 2 amazing rides in Vanuatu, I vowed I would put more energy into having horses in my life again. Merri's invitation was a sign. I showed up and I did ride. I did my first 50 mile ride on Merri's beloved Jose, and I rode Mac as well, and I did 2 LD's on Finneas, who won my heart - with his aggressive, bossy, forward attitude. He reminded me of the Thoroughbreds I galloped, and besides being a grandson of The Black Stallion (which everyone is tired of hearing about except me), he also has Thoroughbred blood. So Merri got me here, and the rest is history. I bought 40 acres further up the creek, underground tunnels and all. It is a very warm, creative, energetic, lively space to be in the Owyhees. And the vast open spaces we are blessed with, we can walk out our doors and ride for miles and miles and miles in any direction. And that leads me up to the past 5 days. Merri, Steph, Carol and I - the Creek Girls - all planned to try and ride all 5 days on our horses, 50 miles each day. I had never ridden 3 50's in a row. Merri is way ahead of me in miles and Steph even more, but it's not a competition. It's about doing what you love and enjoying doing it, however that plays out - trail riding, LDs, 50s or 100's. Phinneas had never done more than 2 50's in a row; same for Jose, same for Carol's horse August. Rhett's last 5 days in a row was in 1998! - although he has over 5000 miles. Carol, Merri and I finished Day 1 and 2 together. Unfortunately, Carol and August had to end the quest for not feeling well. Day 3, Merri and I set out alone and finished. On Day 4, Merri and I had sightings of Steph and Rhett (how can you miss that tail), and Amanda and Batman - and they joined us in the fun. Jose and Phinneas and Rhett and Batman zipped along together along the snake-like irrigation canal, a smooth fast ride up to the Sinker Reservoir. It all looked to me like Mongolia, though I've never been there. 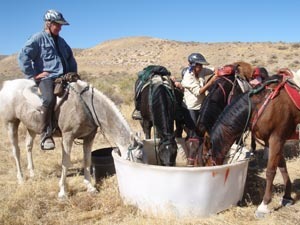 We rode through lower Sinker Canyon together, then split up after the vet check, and we all finished. That made 4 days in a row for me, Merri, and Steph. Day 5 - Merri and Jose, and me and Phinneas went out together. We shared a few miles with 5-day team Nance and Jasbo, and another 5-day team Karen and Thunder, but mostly it was just us 2 Creek Girls and our horses. By this day we knew we would finish; we knew our horses were still strong and energetic, and we were getting more giddy the closer we got to home. Then I had this great idea! I like doing handstands in beautiful places, to celebrate life - places like the Taj Mahal, Macchu Picchu, high passes in Nepal, Mt Rainier. 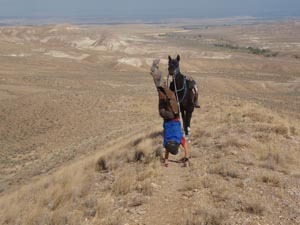 I convinced Merri too, because this was no small feat our horses had (almost) accomplished. Our trail took us up this narrow knife ridge that climbs out of Hart Creek. The perfect spot for a handstand - because it's mostly downhill now to the finish from here. 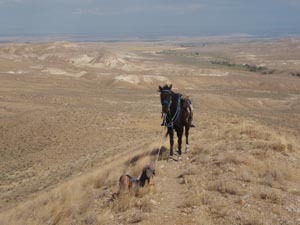 Down below, there is a beautiful view of what we just rode through. It is a bit narrow though. It may be a tricky landing coming off a handstand. However, my landing went amiss somehow, not a desired follow up, in fact a bit dismal. And Merri of course documented it all, so I have to fess up. That is the problem with riding with Merri, for better or worse you may find yourself the subject or a bit player in her blog. And I'm here to say, as she is accusing me, I DID NOT MISS THE SHOT. ***** She did give a gallant effort, twice, and her legs never made it more than 3/4 of the way up, or together, but nor did she fall in a body heap. But these minor details are really not important. 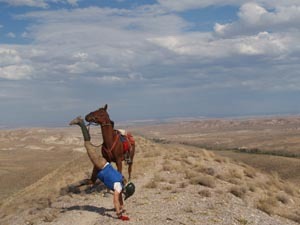 We're not at the Olympics, we did it, our secret celebration with our horses, close to the end of Day 5, on the narrow ridge about Hart Creek Canyon. And that is what life is about sometimes, just showing up, doing your best, giving it your all. We did, and especially our horses did. Back at the finish line, upon our vet completions, there were cheers, hugs, and congratulations all around. Steph and Rhett were waiting, already finished, and Carol was there too. The Creek Girls and their steeds - All for One and One for All. 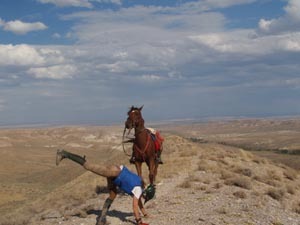 *Merri's note: Linda thinks it's hard too, as she shoves Connie into the saddle on Day 5 of the Owyhee Canyonlands! **Merri's note: And I timed it perfectly with the camera! *****Merri's note: That is debatable! Very cool ladies. Really enjoyed your yarn Connie. 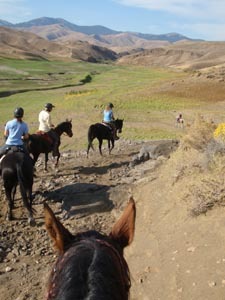 I love seeing pics of Owyhee I need to come back soon. Nice seeing you at NAETC Merri.